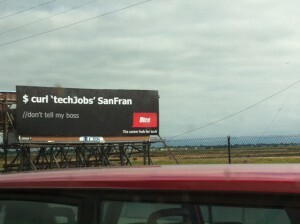 I got this awesome curl sighting from the US101, near SFO posted to me (click for a slightly larger version) a few days ago – showing curl on a very large billboard in an ad for Dice. It is clearly meant to look like a unix style command line that invokes curl. The command line would only be syntactically correct if the user truly has two host names named “techJobs” and “SanFran” and curl would attempt to get their root HTTP document off them on port 80. It gets followed by that C++/C99 comment that really is an odd added context. To me, all the sign shows is a company that desperately tries to look techy but in trying too hard it fails really miserably. I’m really honored my work found its way to such a high profile spot though! I’m the marketing director for Dice.com and I wanted to reach out to you to thank you for spotting our billboard error on the 101. We are deeply embarrassed by this mistake to say the least. In a classic coding scenario, our QA failed us. Unfortunately for us, we bought this spot long-term and we are trying to figure out how quickly we can replace the content. We’ve been working this year to do a better job communicating in a more authentic way in our marketing efforts. Obviously, making a mistake like this makes it look pathetically inauthentic. At the end of the day, getting it wrong is inexcusable, particularly in such a visible way.